Most of the relics below were found on the battlefield of Hohenlinden (3.12.1800) in southern Germany. Button was found on the field of the mayor of Hohenlinden, Mr. Maurer. The number identified the soldier's unit. Like all three dimensional structures it is difficult to see in the forest floor. The camera looks along the former trench. Today the trench might be just some 30-50 cm deep. Local farmers drew my attention to this place. 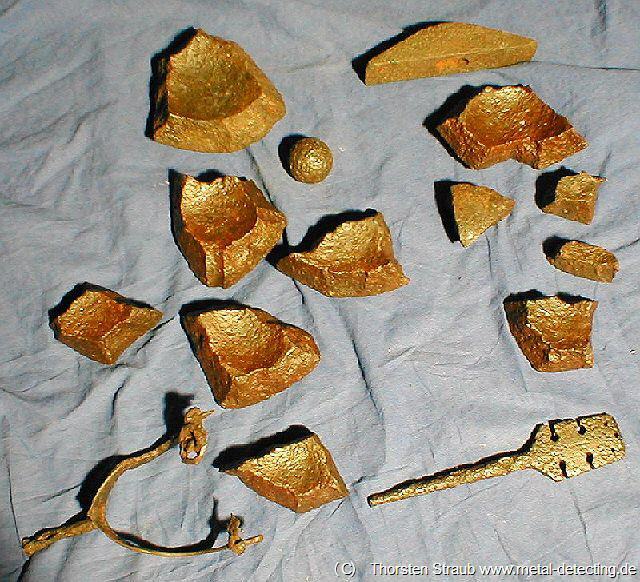 Remains of gold plating or gold color or still visible. Flame design. Solid bronze. Along with musket balls the item was found at an old farm were soldiers were present during and after a battle. Used to remove dirt or pieces of cloth from the barrel. Screwed onto the iron ramrod this cleaner was used to remove dirt from the barrel, especially cloth remains. 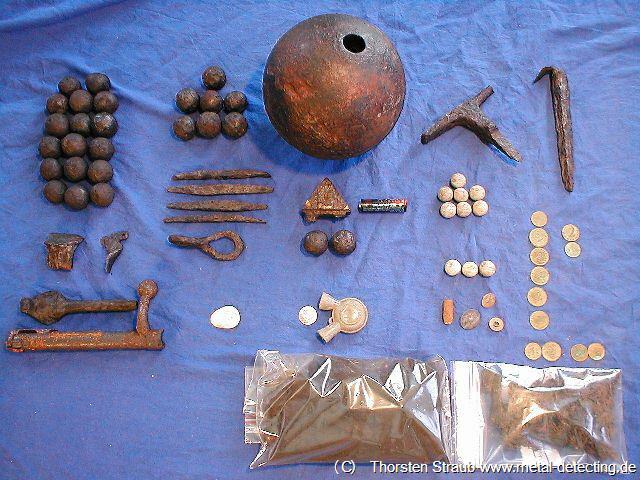 6 inch shell, grapheshot, musket balls etc. 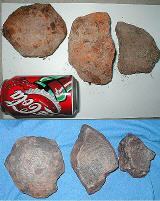 Top left and center: 25 mm /1 “ grapeshot. Top center: 15 cm / 6 “ grenade dud. Grenades are more rare than massive balls. Grenade duds are even more rare. Right of center: Dropped musket balls. White spot bottom left of center: Extremely flattened musket ball. Bottom right: Plastic bags containing the remains of the gunpowder (now harmless) and the wooden fuse. The rifle bolt in the bottom left corner shows the same place saw action again some 150 years later in World War 2. Napoleonic Era. Diameter = 15 cm. AA cell for size comparison. Grenade Fragments 1. Napoleonic Era. Complete grenades as shown above are rare. Usually just fragments are found. Wall is some 1.5-2 cm thick. Drink can for size comparison. Grenade Fragments 2. Napoleonic Era. The balls have a caliber of some 16.5 mm. The gun's caliber was slightly bigger with 17.5 mm = 0.69". After a few shots the barrel was so full of dirt that bigger balls would not have fit. The musket ball represents like no other find warfare from the 30 year war to well into the 19. century. 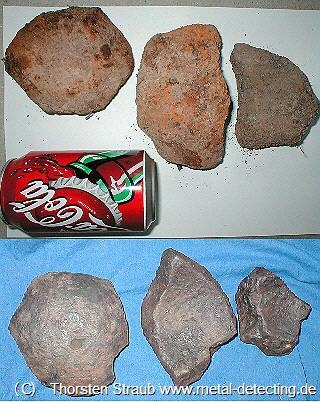 They are found in relative large quantities as they do not corrode and can de facto only be found by metal detectors. 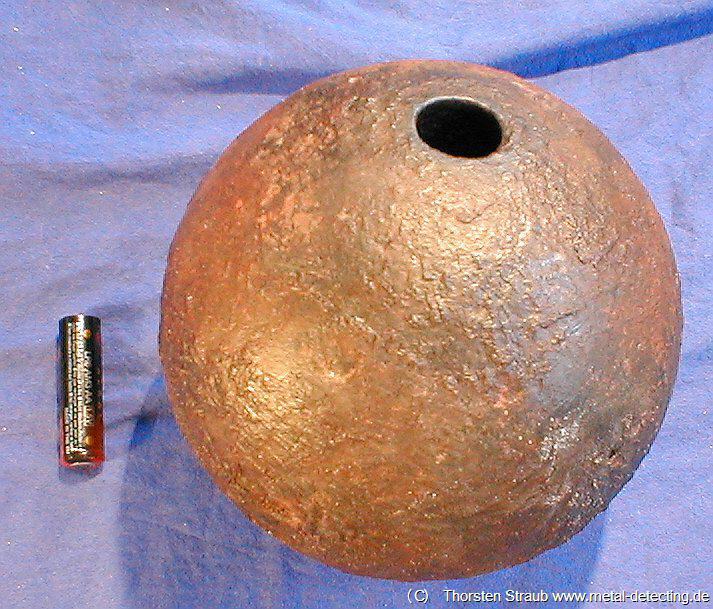 Experienced detectorists often have a jar or some sort of vessel at home filled to the rim with musket balls. 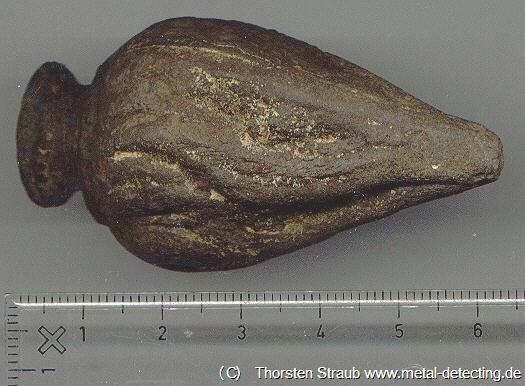 Musket balls are very good indicator finds, i.e. they act as waybills for those who are looking for unknown battlefields. If musket balls are found in close proximity this indicates an unsearched battle field. 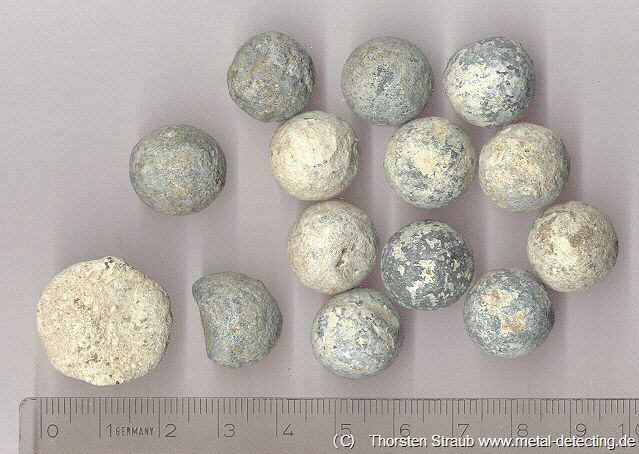 This group of musket balls serve as a representative for all musket balls I ever found. It was found on a single day in a rather small area of some 20 m square. At the time of the battle this place must have been a true death zone. Bottom right is a completely flattened ball. It hit a hard, even surface. The next ball to the right is deformed as if it had hit a soft target. The following pictures were taken at the actual find spot of the musket balls depicted above. To give the reader an idea how close the balls lied to one another the find spot of every ball was marked with a colorful plastic bag. These pictures might give a more vivid notion than a map. During the battle this forest must have been a virtual area of death. The battle forest is also shown in the movie clip below. (MOV File, requires QuickTime). Again, each plastic bag marks the exact find spot of one of the musket balls shown above.